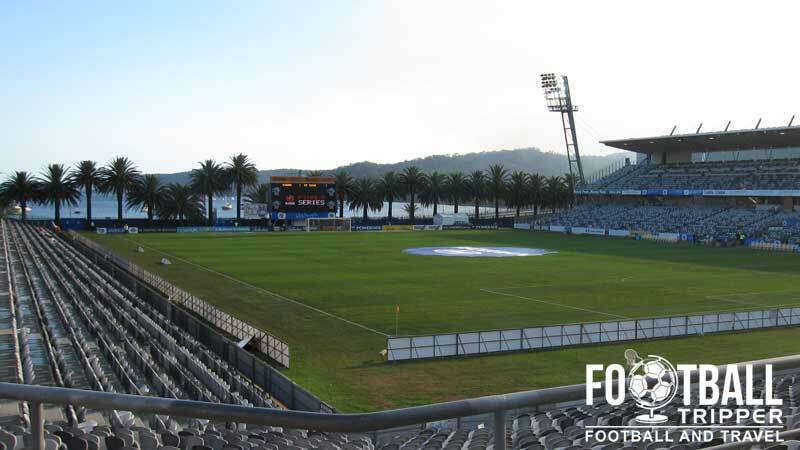 Central Coast Stadium, often referred to by its previous long term sponsorship name of the Bluetongue Stadium is a sports arena in Gosford, New South Wales. The rectangular ground was originally designed to be used solely for Rugby League matches but it is now home to A-League side, The Central Coast Mariners FC. Central Coast Stadium first opened in February 2000 but actually dates as far back as 1911 when Erina Shire Council created a cricket pitch on reclaimed land from the nearby marshes. Known initially as Waterside Park due to the proximity to Brisbane Water, the stadium today is famous for its views of this barrier estuary which separates the greater Metropolitan Sydney area from the central Coast. With a capacity of 20,059 it has long been one of the smallest stadiums in the A-League but this is perhaps slightly misleading as there are currently only three stands built. As part of the design, the southern goal end is lined with palm trees and offers fans inside the stadium a glimpse of the beautiful body of water. Used primarily for the A-League matches of the Central Coast Mariners, the ground is also used for other sports including both Rugby League and Rugby Union with the record international attendance set during the 2003 Rugby World Cup when Japan took on the USA in a Group B qualification match. The attendance figure of 19,653 was slightly larger than the crowd which saw the home team lose to Newcastle Jets in January 2008. Since opening at the turn of the millennium the stadium technically known as Grahame Park since 1939 has undergone several name changes for sponsorship reasons. Upon opening it was known as the NorthPower Stadium at Grahame Park, and more recently in 2006, it was known as the Blue Tongue Stadium after the local brewery – a name which is still sometimes used by sports fans today. Central Coast Stadium consists of the following four stands: North, East, South and West. 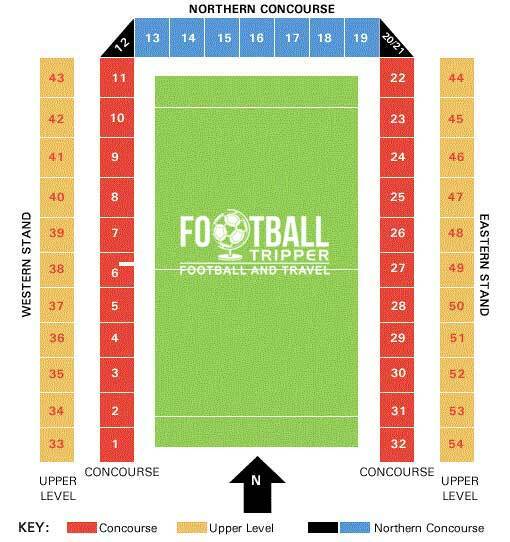 Away fans are usually housed within blocks 29-32 which is the lowest-tier towards the south-east corner of the stadium. Most of the pubs within the immediate vicinity of the ground are to be found eastwards towards Rumbalara Reserve, with the exception of The Settlers Tavern on Central Coast Highway to the west. Mann Street is probably the most commercial road in the local area, and is lined with pubs and restaurants. Popular places to drink include Duttons Tavern, ReviveR, and Byblos Restaurant & Bar. Less than 10 minutes away from the ground is the Imperial Shopping Centre located next to Kibble Park. Inside is the likes of a Subway and McDonalds, and on Mann Street there is Joe’s Pizza Parlour and Gee Kwong Chinese Restaurant. Inside the concourses at the ground there are six food outlets and four bars which offers fans a decent choice of food and drink on matchdays. Run by The Gema Group who are a well-experienced catering group, you can get everything from Mexican Food to English style Fish & Chips, as well as expected stadium classics such as hot-dogs, burgers and pies. Fans can purchase Central Coast Mariners Merchandise either at the stadium on matchdays or from their official online shop. It doesn’t appear as if the club currently operate a full-time store either in the city or at the stadium. 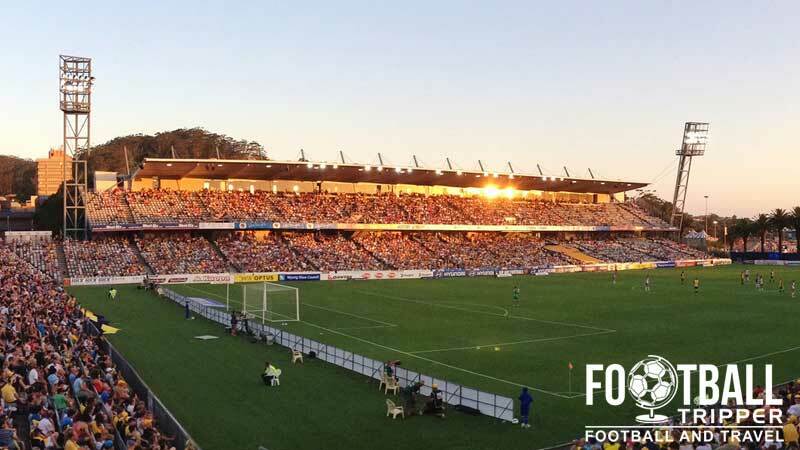 Neither Gosford City Council or Central Coast Mariners currently offer supporters the chance to undertake a guided tour of the facilities at Central Coast Stadium. Of course, if this changes we’ll be sure to update this section. One passionate Central Coast Mariners fan roaring his yellow and black team on. 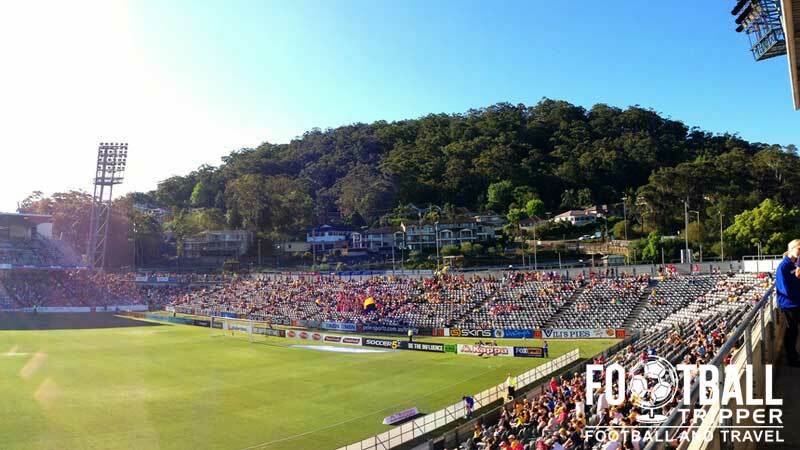 Central Coast Stadium is located a few hundred metres away from the coastline line within the area of Gosford, New South Wales. A fantastic view of Central Coast Stadium from the Pacific Ocean. 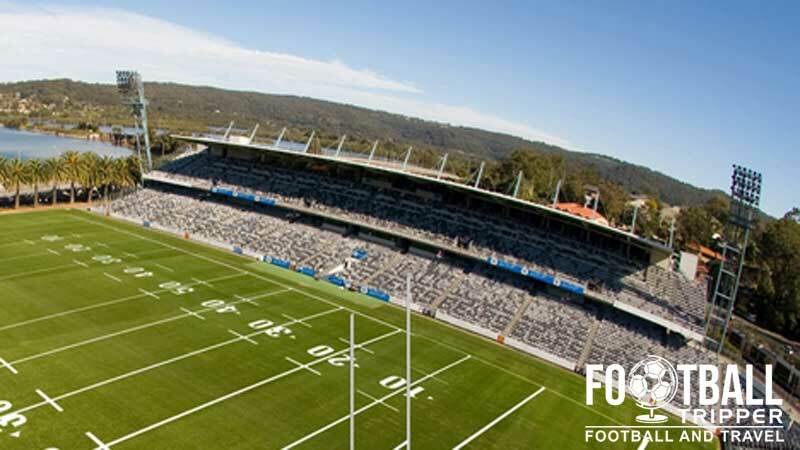 Central Coast (Bluetongue) Stadium, Dane Dr, Gosford NSW 2250, Australia. The closest car park is at Baker Street which is approximately 100 metres away, followed by some spaces at Gosford Train Station which is 300 metres away. Both are located north-east of the stadium, and both have limited room so ensure that you get there early if you wish to drive stress-free. Gosford Train Station is located less than two minutes away by foot, and has numerous CityRail Services to and from all over Sydney, and Newcastle. To find out more information and to see timetables please check out Transport NSW. The entrance sign to Gosford Station – the closest form of public transport to Central Coast Stadium. As the official website doesn’t list the most popular bus routes or stops it’s hard to know which ones to include. Just to be safe we recommend you look at the Busways website to find out the most convenient route for yourself. The two closest stops to the station are Donnison Street before Baker Street numbers 41, 55 and 70, and Mann Street at Georgiana Tce which appears to be served by 15 bus routes including the 17-23, 28, 42-44, 64-66A. The closest hotel to BlueTongue Stadium is probably the Central Coast Hotel, and Hotel Gosford, both of which are no more than 10 minutes north-east of the stadium. To the west just across Pacific highway there is a familiar Best Western, and a Gosford Palms Motor Inn which are worth checking out.